Cleveland Browns quarterback Johnny Manziel has entered rehab to deal with personal problems. Manziel, 22, was 22nd in the 2014 draft after playing college football for Texas A&M, but started just two games last season. 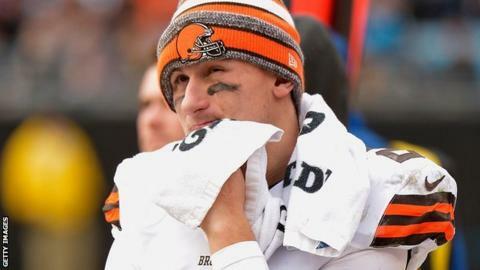 "Johnny knows there are areas he needs to improve on to help him be a better family member, friend and team-mate," his advisor Brad Beckworth said. "So he decided to take this step in his life during the off-season." Cleveland Browns general manager Ray Farmer added: "We respect Johnny's initiative in this decision and will fully support him throughout this process. Who won the social media Super Bowl? Read more on Who won the social media Super Bowl?